Small compact animals, with thin prominent dewlap, and small short horns; mainly kept for draught and are poor milkers; they are extremely active and often have very aggressive temperament. Found in the central highlands of Ethiopia, in Arsi, Shewa, Bale, Sidamo and Harar. 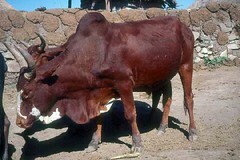 Descended from the recent introduction of zebu into Africa from West Asia. Probably developed from a group of small Shorthorned Abyssinian Zebu by the highland Oromo people.